The rise of new technology and modern eating habits has resulted in unprecedented diversification of the food supply chain, resulting in a wide range of food choices. In order to ensure a continual supply of food, some food producers are treating their crops with pesticides to ensure there is a reduced risk of failed harvests. These pesticides contain chemicals that are toxic to both insects and humans, and as such the general public needs to be protected from these harmful concentrations of pesticides used. There are regulations imposed by food agencies controlling the amount of pesticides used by dictating pesticide maximum residue limits (MRLs). This standard ensures that food purchased off the shelves of grocery stores is safe for consumption. On top of ensuring food that is safe for consumption, it is important to provide consumers with accurate nutritional information, to make informed choices that result in healthy growth. A focus on food content analysis to ensure quality and consistency among different batches is one way to meet these goals. Detection techniques like mass spectrometry allow food manufacturers and producers to screen large quantities of samples quickly, while ensuring repeatable and reliable measurements. The approaches taken to analysis are generally twofold: proactive monitoring of essential nutrients and possible contaminants, and crisis response, in the event widespread contamination requires the rapid development and deployment of analytical methods and equipment. 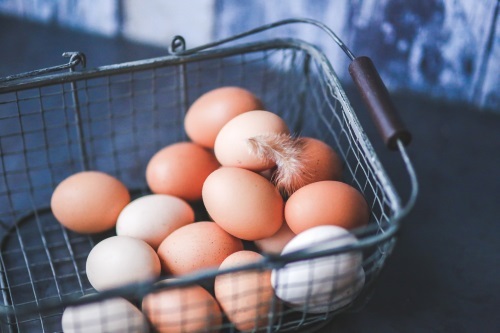 One recent example highlighting the need for crisis response is the fipronil contamination of eggs, which resulted in the global recall of millions of eggs. Fipronil is an insecticide developed in the 1980s. Its high toxicity makes fipronil useful for controlling levels of insects including fleas and mites and is even useful against pests resistant to various insecticides. However, in July 2017 fipronil made news headlines after it was found to be present in eggs across Europe. This crisis was so widespread that by the end of August, fipronil-contaminated eggs were detected in fifteen European countries and as far as countries in Asia such as Hong Kong and China. Fipronil treatment for crops used in the food chain is prohibited and the US Environmental Protection Agency (EPA) has labelled fipronil as possibly carcinogenic, prohibiting its presence in the food chain. Another governing body, the European Food Safety Authority (EFSA), dictates fipronil concentrations of under 5 mg/kg to be safe for human consumption. Complying with concentrations dictated by regulation is therefore vital for manufacturers and producers to ensure the continued safety and confidence in food supplied to the public. There are several plausible methods of detecting contaminants such as fipronil in samples of food. The most common detection methods include LC-MS/MS (liquid chromatography coupled with tandem mass spectrometry) and GC-MS (gas chromatography coupled with mass spectrometry), with both requiring different methods of sample preparation prior to analysis. Mass spectrometers turn the atoms into ions. Then the ions are separated by passing first through an electric field, then through a magnetic field, so they fan out into a spectrum. A computerized detector tallies the ions in various parts of the spectrum and you can use this information to figure out what kinds of atoms were in the original sample. The challenge arises in detecting fipronil concentrations at the low level stipulated by government regulation. However, novel methods capable of detecting fipronil and its associated metabolite, fipronil sulfone, have been developed. Since the fipronil contamination scandal began, demand for a fast, sensitive detection method has only continued to grow. One such detection method involves using a Triple Quad 6500+ LC-MS/MS instrument using electrospray ionisation. The high sensitivity of detection, and ability to analyse two compounds in the same machine run, enable regulation-compliant detection in a timely manner. This developed method can detect fipronil, as well as its major metabolite fipronil sulfone, to the MRL level of 5 mg/kg, as demonstrated in Figure 1. Figure 1: Demonstrating the assay sensitivity for fipronil and fipronil sulfone analyte detection. In responding to food contamination crises, it is also prudent to develop methodology that can screen for multiple contaminants at once, potentially preventing contamination from other, unexpected sources. Combining instrumentation that provides linear, reproducible contaminant detection to regulation-specific concentrations, with novel sample preparation methods, is essential to avoiding repeat events, and helps improve public confidence in the integrity of the food supply chain. While fipronil is known to be hazardous for health, regulatory advice on other pesticides such as glyphosate is conflicted. Glyphosate is a widely used systemic herbicide and crop desiccant. While it has recently made headlines for its potentially carcinogenic nature to humans, its impact on human health is contested and therefore, the use of glyphosate as a farming pesticide is still permitted. In cases where potentially harmful pesticides are being used, continual monitoring is required to ensure chemical concentrations in foods are safe. Glyphosate is used globally and has been detected at trace levels, in topsoil and in samples of milk. The controversy surrounding the use and potential contamination of glyphosate has placed greater emphasis on data collection and analysis methods to ensure levels of glyphosate in food samples fall below the safe MRL (reported by the EFSA as 50 mg/kg). Using a combination of sensitive MS instruments, such as the QTRAP 6500+ (SCIEX), accurate quantification of glyphosate and its metabolites can be achieved. By combining the LC-MS/MS method with differential mobility separation (DMS) technology, interferences can be removed from analyses to improve the signal-to-noise ratio and consequently, boost confidence in quantification results. These samples are then analysed using LC-DMS-MS/MS instruments that can quantify and identify contaminants present as shown in Figure 2. 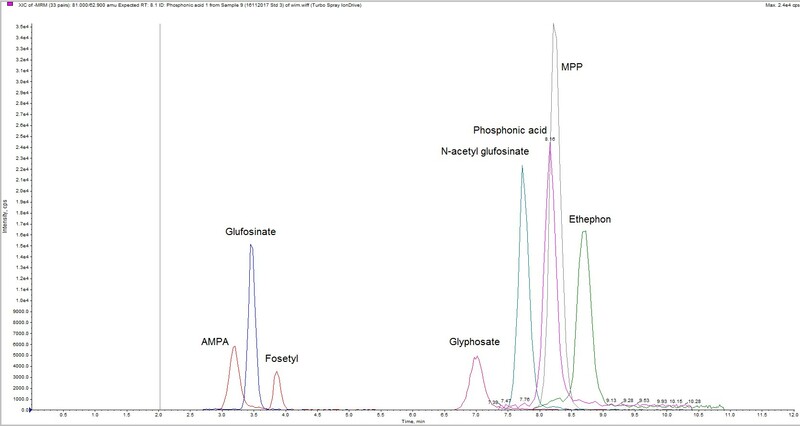 Figure 2: MS spectra provide the ability to clearly identify and distinguish glyphosate and its metabolite AMPA and other pesticides such as glufosinate. Across the continent, food safety regulators like the United States Food and Drug Administration, and European Food Safety Authority are updating their food regulations. In recent years, China, Taiwan and other areas in Asia have revised laws and regulations, as seen in the Food Safety Law and the Act Governing Food Safety and Sanitation respectively. Furthermore, the ASEA Economic Community, AEC, will put new food safety frameworks in place as it continues to make food safety and security a priority. There is a demand for powerful and rapid analytical methods that can detect very low concentrations of pesticides in mycotoxins in a variety of sample matrices. These challenges open up opportunities for food testing laboratories to collaborate with government agencies to help ensure that the food being sold is safe for consumption. Equipment manufacturers can provide reliable and accurate laboratory-based methods and solutions for detecting unwanted chemicals in food, potentially saving lives. LC-MS is deemed as the gold standard for analytical testing of food because of its unparalleled sensitivity. The overarching merits of MS systems for food testing include the capability to find targeted chemical contaminants with very high specificity. As such, in order to ensure higher levels of food safety, food testing labs or governmental bodies should consider including an MS machine in their food testing line-up. As the fipronil case shows, spinning your ions first leads to healthy scrambled eggs.